Good lad 3 Pc. holiday set with cable knit vest with black corduroy pants and red polo for baby boy. 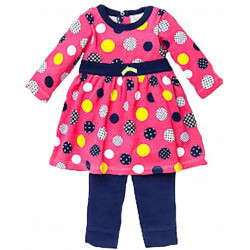 Size: 3-6, 6-9, 12-, 18, 24 Months. A dress-up, but comfy style for baby boys this holiday season. 3 Pc. set has a red polo long sleeve knit shirt, black corduroy pull-on style pants and a cable knit sweater vest in a cream color with black and red trim at the sleeves and neckline. Bears appliqued on the vest and ready for the holidays with their bright red scarves. Sizes: 3-6, 6-9, 12, 18, 24 months.